Cold Steel is pleased to give American Law Enforcement Heroes a knife named in their honor and expressly designed to serve them"”the American Lawman. The drop point blade is made from Japanese AUS 8A stainless steel and hollow ground to a thin, hand-polished edge. It is as sharp as a serpent"s tooth and will easily sever the toughest, most fibrous materials. To further protect it from rust and the constant exposure to inclement weather, it comes with a black, non-reflective Teflon finish. Supplied with dual pocket clips and twin thumb studs, it"s completely ambidextrous and can be opened one-handed in a flash. 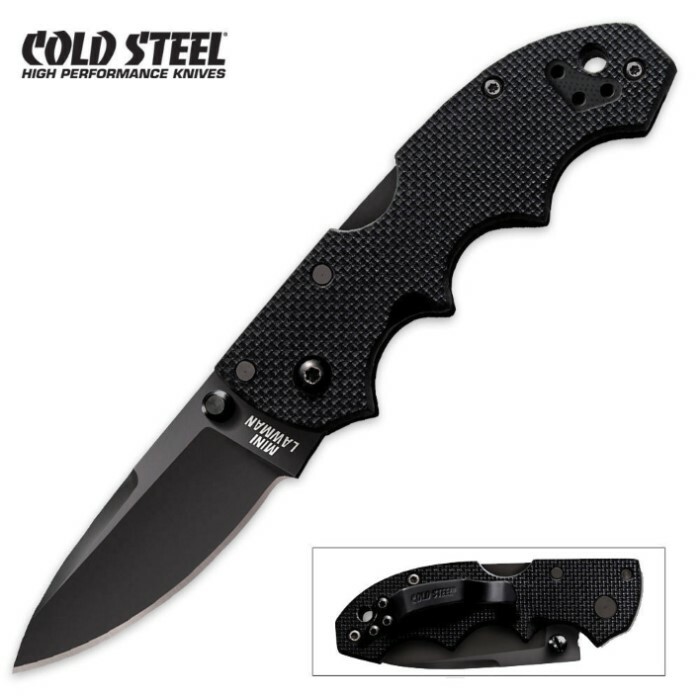 Equipped with heat-treated steel liners overlaid with black, aggressively textured G-10 handle scales. Includes Cold Steel"s Tri-Ad locking mechanism. Please note: Current stock of this knife is using the new/updated pocket clip from Cold Steel. Really good knife, just keep in mind the clip on the picture is different as it notes on the bottom of the description. True Swords: Excellent service. It came quickly even when I did have a big order. Thank you. Cold Steel American Mini Lawman: It is an excellent knife. It takes a lot of my abuse. I cut myself to see how sharp it is, and I am satisfied with my deep wound even though I did it with no strength. The lock back is excellent and surpassed my high expectations. The steel is great and the knife does seem small, but the handle fits comfortably in my hand. It is good for concealing. Overall, this get a 10/5, but the scale won't show you the 10 and just the 5.